Can Alexa play audible? Absolutely yes. Actually, among your smart home devices, Alexa would be one of the most innovative devices ready to take you to an amazing world by reading Audible audiobooks to you. Thus, when you are busy with the housework or closing your eyes and resting your mind, you can enter your libraries and listen to your favorite books for free. To enjoy more, it is necessary to know about how to play audible on Alexa. And here comes some information on Alexa and audible. Audible is an online bookstore which sells digital audiobooks, radio and TV programs, and audio versions of magazines and newspapers. Nowadays, Audible has become the world’s largest producer of downloadable audiobooks. 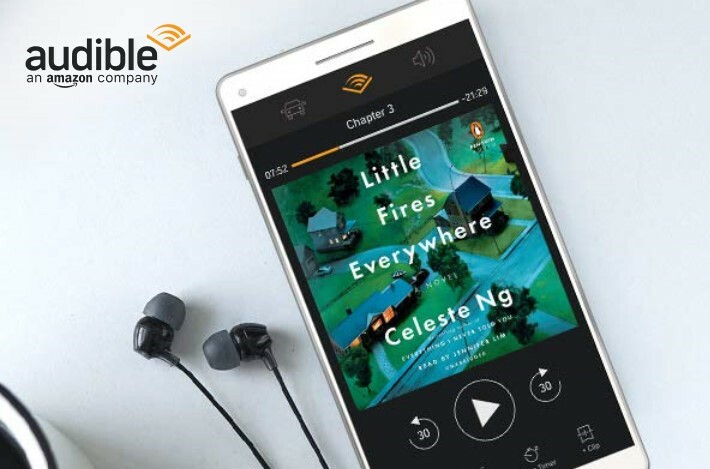 Audible audiobooks allow you to “read” a whole book when you are doing other things so that you can manage your time properly and read more books even in some intervals. However, Audible audiobook can only be accessible by means of an Amazon user name and password because of proprietary prevention. And you can usually listen to Audible audiobooks on Alexa. Developed by Amazon, Alexa is a virtual assistant first used in the Amazon Echo and the Amazon Echo Dot smart speakers. It is known that Alexa is capable of voice interaction, music playback, making to-do lists, streaming podcasts, playing audiobooks, and more. 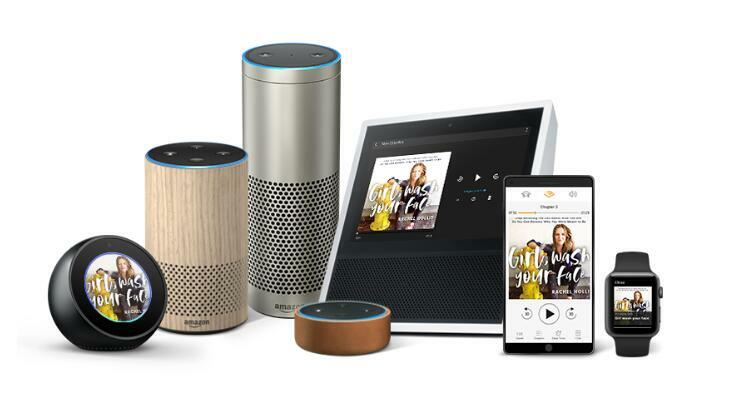 Alexa can also control several smart devices using itself as a home automation system which Alexa can interact with devices from several manufacturers. Currently, interaction and communication with Alexa are only available in several kinds of languages such as English, German, French, Italian, Spanish, and Japanese, which means that you can listen to audiobooks from different languages. Moreover, Alexa can read your books on any Echo device as long as you’re logged into your Amazon account. And Alexa App will help you to get Alexa to play a specific audiobook. 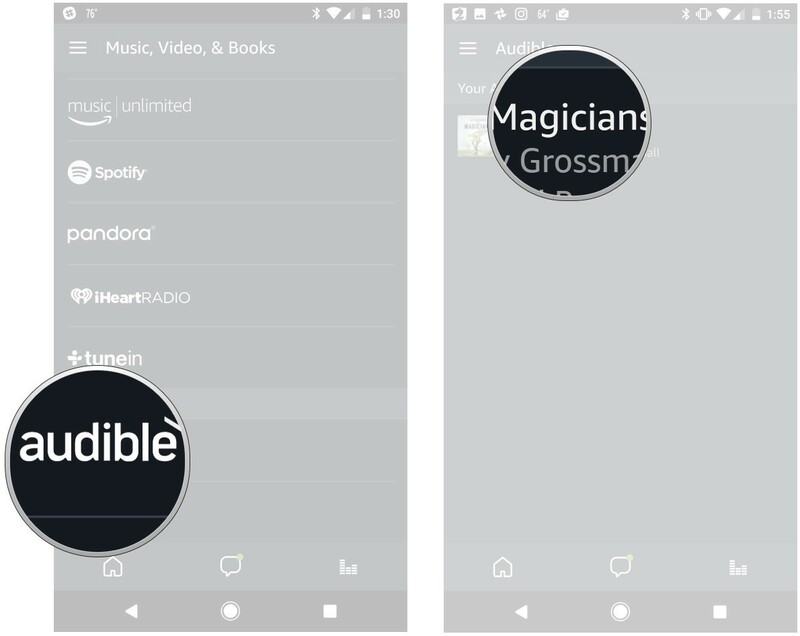 When you have purchased some audiobooks on Audible store, you can now sign in Alexa app to your Amazon account and then it will automatically sync up your library and make you listen to the audiobooks. And then you can follow the simple guide here on how to play audible on Alexa using your mobile phone. 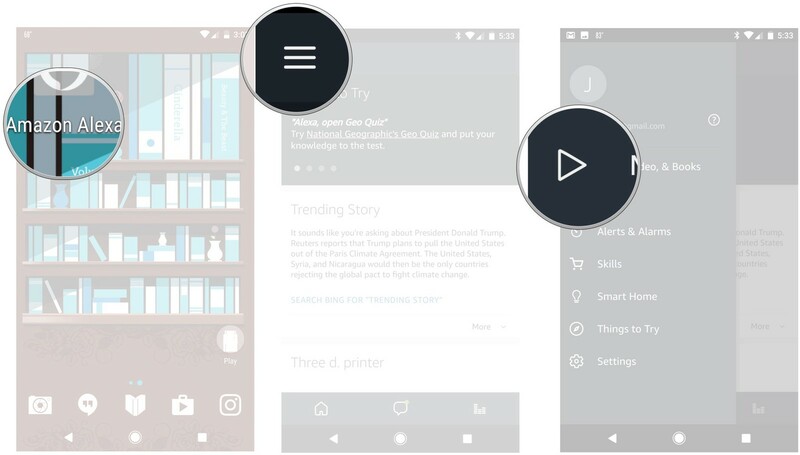 Step1.Install and Open Alexa app on your mobile phone. And then tap the overflow icon > Music, Video&Books. Step 2. Scroll down and choose Audible, and then select the audiobook you would like to listen to. You can also ask Alexa to read the audiobook by simply saying: “Alexa, read [name of a book] from Audible” and it will start reading the audiobook for you as you like. This Alexa audible command just asks Alexa to read any Audible audiobook and enjoy a great listen without lifting a finger at all. Start with, “Alexa, read…” or you can also say “Alexa, play [title of a book] from Audible” to start reading a book. When you are willing to skip ahead to the next chapter, you are saying the command to make it. pause, or go back. With Alexa, you’re always in control of your Audible audiobook. Alexa allows you to set a sleep timer before you go to bed. If you are afraid of missing a moment of your listen, you can set a proper period of time with this command. When you are going to go out or to do some work, you directly say this command to pause the reading immediately without tapping any button. 5.“Alexa, go forward/go back 2 minutes." This is the command for moving forward or return. This is the Alexa Audible command for the narration speed. Except for these Alexa Audible commands, there are also many other ones for accessing your library, discovering free content, and so on. You’d better remember them for better enjoying Alexa and Audible. When you are wondering how to play audible on Alexa and back up Audible audiobooks at the same time, you should follow another useful solution. You can play audiobook on Amazon Echo by uploading it to your Amazon Music account for backup. You know that all Audible audiobooks are protected by DRM copyright technology in order to make sure the proprietorship of subscribers and artists are legal and protective, which allows you to play audiobooks to selected devices. In order to freely play audiobooks on Alexa, you should remove DRM first with the particular DRM removal software and convert the files to DRM-free MP3. After that, you can back it up and listen to Audible on MP3 player as well as on Alexia if you like. And Leawo Prof. DRM is one of the most popular and powerful software that can help Alexa read audible books. After entering the main interface of the program, click on Add Files button on the sub-menu bar or in the middle of the program interface to add the AAX audiobook on the pop-up “Add File” panel. Choose audiobook files you would like to back up to your PC and click “Add” to begin importing from Audible into Prof. DRM. Or use another alternative way to add audiobook by directly dragging and dropping the target audiobook files to the middle of program interface. Under the category “audiobook”, check whether the target audiobooks are imported. And then you can select any audiobook file and click on “Edit” icon to freely choose Channels, Sampling Rates and Bit Rates. Output format is MP3. Go to the bottom of the interface, click on the three dots on Output option to choose an output directory to save the output MP3 audio file. When you finish all the settings, you can simply click on the blue Convert button at the bottom to start removing DRM from Audible AAX audiobook, and then convert AAX to MP3. And the DRM removal and conversion process will be completed in a while. 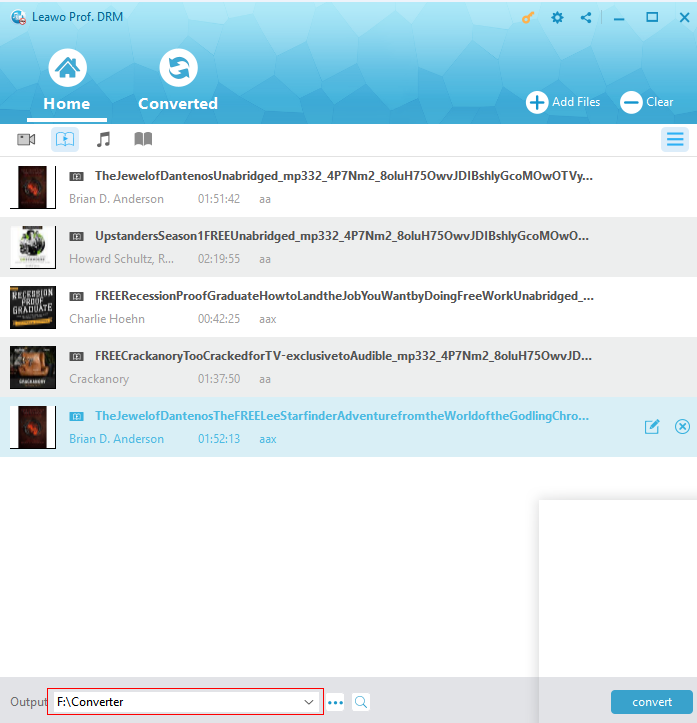 Once the conversion finished, you will get the DRM free MP3 audiobooks available on your PC. You can also enter “Converted” tab to check the output converted audiobook. And then you are allowed to click the “Open file” option of the target file to open the output MP3 file. Since you have got DRM free audiobooks in MP3 format, now you can listen to Audible audiobooks on Amazon Echo with Alexa in simple steps. Step 1. Make sure you have installed the Amazon Music on your computer. Step 2. Open Amazon Music and copy the converted Audible audiobooks into My Music section. Step 3. When the audiobooks are added to your Amazon account, you can easily play Audible on Alexa using the commands. Obviously, it is quite easy to listen to Audible on Amazon Echo by directly connecting Audible to Alexa. If you are going to back up the Audible books and enjoy more at the same time, when you are listening to the audiobook, a third-party software like Prof. DRM is an excellent alternative to help you remove DRM protection free from the books and download DRM-free MP3 audible files for backup. Anyway, can Alexa play my audiobook? Definitely. The two solutions mentioned in this post have given you the detailed instruction on how to play audible on Alexa and you will get Alexa to play a specific audiobook as quickly as you can. You can choose any solution according to your actual needs.